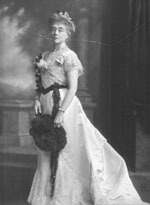 Mrs Joseph Hodges Choate, née Caroline Stering. Sitter: Mrs Joseph Hodges Choate, née Caroline Dutcher Sterling; daughter of Frederick A. 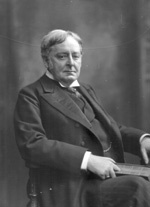 Sterling of Cleveland, Ohio; m. (1861) Joseph Hodges Choate (1832-1917), US Ambassador to Great Britain 1899-1905. 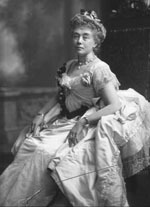 Mrs. Choate, the lady who is now acting as hostess to our innumerable American Coronation guests, possesses the great distinction of being the wife of the wittiest citizen of the United States. Though an old story, the pretty compliment paid by Mr. Choate to the Ambassadress is well worth repeating. “If you were not yourself, who would you be?” was asked of the Ambassador. Why, Mrs. Choate’s second husband!” came the instant reply. The Ambassador and Ambassadress had a unique compliment paid them by King Edward and Queen Alexandra. Early in June, their Majesties dined at the American Embassy, an honour never before granted by a British Sovereign to the representative of a foreign power. Descr: FL standing with fan. Biog: Who's Who (Entry for J. H. Choate); The Sketch, Coronation Number, 13 August 1902, p. 133. Reproduced: The Sketch, 13 August 1902, p 133; Chic, 26 July 1902, p 334; Tatler, 13 August 1902, p 270; The Evening World, 15 September 1902, p. 9.